St Yzans is a quiet little village perched on a small hill in the middle of vineyards. Is has a big church, a small school, a Citroën garage and one little shop that is also a café. In the morning a white car delivers baguette to those who want it, maybe not the best baguette in France but a charming feature nonetheless. The village is so small that if you walk any street, in any direction for a few minutes you’ll find yourself amongst the vines. One of those streets is my street, rue de Loudenne. House number one on that street is an L-shaped old stone house with countless rooms and vast corridors. It’s been empty for years, safe for a few rooms that were inhabited by the previous owner’s mother. Everything else remains untouched, no weird renovations and less favorably, not much restoration. My first love in this house is the old staircase, so grand, so beautiful that I would have settled for only that. I remember walking through the front door for the first time in late January this year, then standing still for a few moments, imagining my children running up and down the stairs, followed by dogs, of course. I imagined myself walking down the stairs on a festive evening wearing a long, elegant, flowing dress, followed by dogs, of course. Next to the staircase is the kitchen and I imagined persons of the past streaming in and out of the door, holding silver trays with delicious food, carrying them up the stairs and into the other wing where guests would dine under crystal chandeliers. Maybe they are still carrying trays up and down, who knows, in any case the house has been idle for so long I am sure the ghosts are happy to have some company. Next to the kitchen on the first floor is a room, then another, and then a bigger room, the harvest room, which will be the principal room for my cooking workshops and restaurant. That room has an old staircase and under it, another kitchen, smaller, more rustic – even prettier than the first. In a few weeks or months all these rooms will be filled with food. They will be filled with bistrot chairs and simple tables, with mountains of fresh vegetables and fruits, with birds and hams and sausages hanging from the ceilings. Chests and cupboards will be overflowing with silverware and white cotton napkins and tablecloths. In one corner of one of the rooms will be the prettiest pine-wood cupboard that reaches from floor to ceiling – that’s where we’ll keep the tableware. Outside the harvest room we have just planted a nicely sized olive tree with thousands of shiny black olives and next to it a few smaller ones. It makes me happy to think that next summer guests can dine in the shade of that tree and on rainy days we’ll leave the dining room doors open so everyone can enjoy the comforting sight of summer rain showering the garden. Right now the only room that’s ready, and it isn’t REALLY ready, is the kitchen. Though we haven’t moved in yet we have already had several meals in there, to try it out, and mainly just because I adore being there. Everytime I leave I feel sad, if it wasn’t for my big family I think I might just sleep there on those red and cream kitchen floor tiles. When we first made an offer for the house we found out that it was once owned by a formidable lady called Plantia Pautard. She always wore black dresses and she loved to cook. This much I knew, but the last few months have seen me piecing together little bits of information, old photographs, documents and declarations. But what did she like to cook? Everytime I run into someone elderly in the village, someone who might have known her I am all over them like a hawk. Luckily they are all happy to share. So far I’ve found out that she loved to make coq au vin. I discovered that blanquette de veau was her absolute signature dish, a recipe she reserved for special occasions. Last week I ran into an older man in the village who remembers her from the time he was a little boy. He used to bring her fava beans from his parent’s garden and he told me she used to scold him if they were too small. She like them big for her favorite soup which just happens to be my favorite soup too. Everyone remembers something about her cooking. I believe in coincidences but I also believe in fate. So far everything Plantia liked I like too. In fact I like it so much that it’s all in my cookbook “A Kitchen in France”. And from now on I’ll be cooking them in her old kitchen in France. As I said there are coincidences … and then there is fate. The kids are just as excited as I am about my cookbook, but for different reasons perhaps. Louise has been counting the photos of herself and while she’s not unhappy about her grand total she’s a bit bothered by the fact that the biggest photo is of her brother and main rival, Hudson. He in turn is more of a worrier and asked me lately if I was sure that all the recipes worked. “Of course they do”, I answered “You have my food every day – don’t you like it?” “Yes I know YOU can do them but maybe they printed something wrong and everybody will be angry” he said. So he decided to try one and insisted that he would choose it himself. He’s been very interested in wine since we decided to make our own and though he was initially leaning towards the chocolate meringues he decided to go for the Médocain Pears drenched in wine. I promised to help, but not too much. My new fireplace, complete with a 650-kg iron sculpture is just screaming to be used so this week I kept my promise to the restoration guys and cooked them an entrecôte (rib-eye steak) feast with shallots and bone marrow – also from the book. Call me crazy, delusional even but everything seems so easy in that kitchen, everything just falls into place. It’s as if all the cooking that happened there once upon a time is simply waiting to happen all over again. And for those of you who are wondering what we were doing driving around vineyards in a flag colored 2CV – here’s the explanation: It belongs to a friend who lent it to us for some filming we were doing last week and Oddur just can’t bear to give it up (even if he has problems starting it). 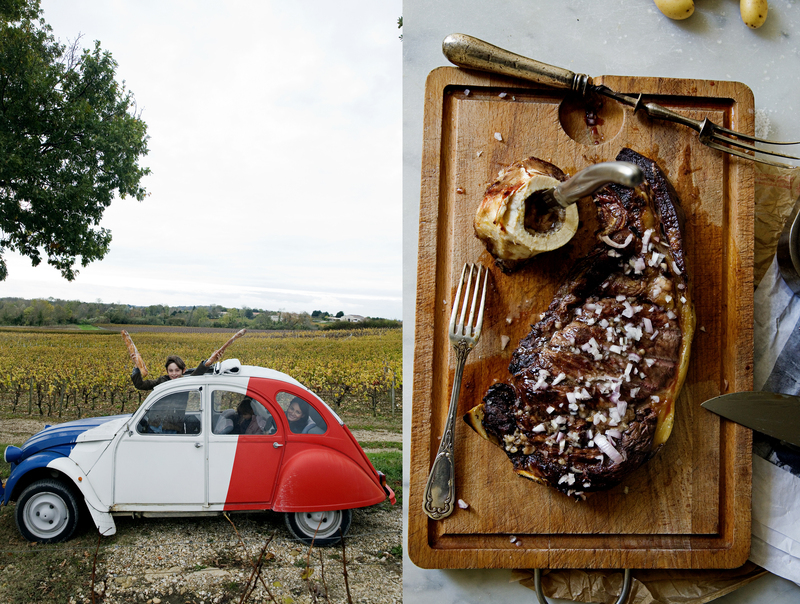 Driving around in the French countryside in an old Citroën, with just a few baguettes and a piece of Camembert is not the worst way to spend a chilly November afternoon. On a practical note so many of you have been in touch and shown interest in my upcoming cooking workshops. We are still working out the finer details, prices, duration etc but I am thrilled to announce that we will start on the 17th of March 2015. We decided not to wait until the guest rooms are ready and have found some great places to stay for those of you attending the first classes. So for those of you who are really interested and who are able to come in March please don’t hesitate to contact me – that first class will be a special one. Amazon – B&N – Indiebound and in bookstores. Recipes from my book “A Kitchen in France”. A big juicy entrecôte, or rib-eye steak, seasoned with just salt and pepper and cooked over high heat until crusty and juicy, has always had a special place in my heart. Frankly I didn’t think it could be improved on—that is until I moved to Médoc. As you will be well aware of at this point, the people of Bordeaux love adding shallots to everything. Here they work wonders and really complement the flavors of the meat. Add a bit of bone marrow ,and you are in meat heaven. It’s fine to cook this entrecôte on a regular grill but if you want the full Bordelaise effect, I recommend adding dried grapevines to the fire so that a hint of Cabernet or Merlot finds its way into your steak. Having this dish without a glass of red wine is a crime! To remove the marrow from the bones, put the bones in a baking dish and bake until the marrow is soft enough to scrape out of the bones, 10 to 15 minutes. Prepare a medium-hot fire in the grill. You can add dried grapevines, if desired (to increase the smoky flavor). Season the meat with salt and pepper. Grill the meat until browned and cooked to medium-rare, 3 to 4 minutes per side. Heat the blade of a knife over the grill and spread the bone marrow over the meat. Sprinkle the shallots all over. Remove from the grill and serve immediately. In a saucepan large enough to hold the pears standing upright, combine the wine, sugar, vanilla bean and seeds, cinnamon, bay leaves, and star anise, mix well, stirring to dissolve the sugar, and bring to a low boil over medium heat. Add the pears, stems up, cover, and simmer, turning the pears occasionally so they cook evenly, until they are tender, 30 minutes. Let the pears cool, then refrigerate for 24 hours in the syrup. To serve, divide the pears among shallow bowls and spoon some of their syrup over them. I do agree. About the pears. The painting. And the eating them first. And, of course the utter delight it must be so close to moving in. Do you have a newsletter sign up for classes yet? I’d love to get more information. It’ll be a dream come true to learn from you! Aaargh….what a lovely and truly exciting post! How sweet of Hudson – the recipes definitely work, not that I’ve had a chance to try them all yet, of course, but they work. Darn it, the 17th is the date that my father arrives back from the West Indies and I have to collect him from the airport and settle him back home otherwise..you know I’d be there. The workshops sound FANTASTIC. Another wonderful post. Thrilled you’ll be starting the classes in the spring–hope to get to france in june and, if so, will see if there’s space in some mid-June classes. Your excitement permitted your post. Only one request, please. can we have a picture of the baby????? Dear, dear Mimi ! I will be able, and i am joyful about it, to come in march ! Est-il possible de “réserver” ? Je ne sais pas trop ce qu’il faut faire. Merci pour ce blog merveilleux, et pour le livre, que je dévore et que je chéris. NK. You just warmed my soul as I sit here in MN among early snow and early cold. The post gave me smiles and sweetness and hunger! And I just ate. Excellent news on the workshops. Do you have dates for April? Would love to reserve two spaces! Your beautiful cookbook arrived this week and I am beyond thrilled to start my French cooking journey. The pictures transport me to the very heart of what I can only imagine the French countryside to be, all from my little rainy corner in Vancouver Canada. Merci! Hello Mimi, I hope this finds you and your family well. I’m so excited for you; it looks like you’re turning your new house into a lovely home! A couple weeks ago, I scoured the bookstore searching for your cookbook to no avail. Just when I was about to give up—there was a stack, ready to be devoured. I will let you know how my first attempts turn out, but the photographs look delicious enough to eat! You have no idea how much peace it brings to peer into this little window you’ve opened. Sometimes we all need to be reminded of just how beautiful life can be. I’m very interested in attending your first workshops; I’ve never been to France and this seems like the perfect introduction. I want to reserve a spot now and I will contact you further. Thank you for sharing your passion and inspiring others to do the same. Take care. Just received your beautiful cookbook and have devoured the recipes, photos and commentary. I have already made several dishes. Thank you for your posts–I always look forward to them. if I can’t come to the first class in March, I will certainly see you in NYC next week! How fun! I will bring my book and my red Goyard so you know it’s me! your kitchen looks like a dream, with that fireplace! but I am most distracted by the photo of the DOG AND POTATOES!!! congratulations on the book, the workshops, the château, the delightful discoveries of Plantia, it is all like a page out of a storybook. Congratulations on dreams coming true. This reads like a magical, enchanted novel that I cannot put down. I love your new home and delight in the adventures it is sure to share. I am enjoying your cookbook, grilled rib-eyes next, my love simply cannot believe we can improve on ours, but I am feeling it is fated. Please put me on your list for the first class March 2015! I may have three girlfriends making the trip too!!!! Darling & delicious. Here’s toasting your book! I have so enjoyed your posts over the years, following your journey so far has been inspiring. Yesterday my book arrived and has already been read and pondered over. How exciting you already have a date for starting your cooking classes, something I am looking forward to. Congratulations on producing such a lovely book. I have your wonderful book at home, it is amazing to have the impression to Know the author! Your Louise who is my Églantine’s âge is so touching. Wonderful description of St Yzans thank you, much better than my previous attempts to orientate via Google street view. Uncle Amazon, or in your case ‘the stork’, delivered your baby last week and yes, she IS beautiful. Friends here in Jervis Bay have a 2CV Citroen. There’s a special faraway feeling ie to France each time I see it puttering/spluttering along. Sounds as though the renovations and plans with the cooking workshops are falling into place. You’d have made Plantia proud! because of you, I finally love fall now !!! That’s some fireplace Mimi! Is that a horse and horseman behind the smoke? Is he attached to the …? (they have the unfortunate name of firedogs here). Very very nice looking Stove also – Brand? Agree, the dog with potatoes is an awesome photo. Such character comes through the dog! Also love the red and cream tiles, so much. It’s just unbelievable how your enjoyement reminds me life in our vacation house ! the fire place where my father used to cook, the old citroën, a way of living I loved so much ! I am so impresssed too with your “rendez-vous” with this house and the name of Plantia Plantieu, a real name for a “roman” ! Your story talks to my heart, wakes me up about a life I would be so happy to live again. Thanks so much to share your dream and happyness. I am sending you an email regarding the workshop. Un grand merci et félicitations pour ces magnifiques articles !! Je suis votre blog depuis cet été et nous rêvons devant vos recettes et photos qui mettent si bien en valeur la cuisine et le terroir français. J’attends avec impatience la publication de votre livre en français, car j’ai du mal à cuisiner autrement que dans ma langue maternelle 😉 Bonne continuation dans tous vos projets !! Bien amicalement, Alice Rogéré. Bravo Mimi pour être allée jusqu’au bout de vos rêves, on ressent véritablement dans cet article votre amour pour la cuisine et toute votre sincérité et excitation pour ce projet de maison d’hôte. Lorsque je serai de passage à Bordeaux, je sais ce qu’il me reste à faire ! Bonjour! Nous sommes si heureux de partager nos passions, et surtout ce livre de recettes… fait avec amour! votre blog est délicieux, bravo! Mimi, it is has been too long since I’ve been here to comment, but I just want to tell you that your personal and professional successes are such an inspiration! Your husband captures such lovely moments in your lives, your children are gorgeous, your dogs are simply hilarious (I love how this little guy has his potatoes ready for a photo shoot!!!) and your kitchen is marvelous. My French style kitchen is similar; it is SIMPLE but has that distinct French design and I love it. Oh, and please do tell Hudson not to worry, his mama’s recipes work deliciously. All the best in New York!! P.S. You look so radiantly happy, and rightly so. Cheers!! … pure magic is happening here. And this burgundy red…. ♥♥♥. # i still have a princess dream since i got your news of buying this house# to celebrate my wedding in the Thorisson Villa, with your food, endless wine & only best friends. I applaude your way of living life away from the hustle and bustle of a big city and give your kids a childhood in the French countryside. It’s not easy to take the decision to move away. Now here’s a question for you, how do you manage to cook for everyone and balance your tours and workload? It’s always interesting to hear real stories of how women balance being there with wholesome food and hugs and care for their family but also being successful and find time to build something for themselves!..while looking calm and collected nevertheless! photos are wonderful! will see you in New York! Lovely pictures, beautiful book, I’m buing today for my sister’s birthday! I am so in love with your new house, every thing sounds and looks beautiful, the tiles, the pieces of furniture, the marble tops, etc… Oh in Love! Good luck in the restoration, May God bless you, your family and your new home. PS I am traveling back to London this Monday, I can’t wait to hold your book and look in the pages, I am sure I will hug it. Greetings from London, enjoying my kids and the beautiful London at this time of the year. I can’t believe it I have your book now with me, so in Love with it. It is like meeting you again and your lovely family. Gorgeous photography, delcious home cooking recipes, beautiful. I wish it was a signed copy. I did a pre order through Amazon, it will however only be arriving in December, I can’t wait for it. Please do send me information regarding the cooking class in March 2015, we are very interested in attending- especially interested in visiting this charming town you found and seeing the renovations on that amazing house! This is gorgeous and I cannot wait to buy this cookbook! Felicitations on the belle maison! All my Best and bonne chance for your upcoming trip to New York! How lovely to see your beautiful eldest daughter in the photos! Je suis vraiment intéressé pour les cours de cuisine et j’aimerais être là en mars, comment on fait pour s’inscrire? La 2cv m’amène beaucoup des souvenirs, quand on était petits, mes frères et moi, ma mère avait la même voiture! Je l’aimé tant que quand il l’on vendu j’ai pleuré ! J’hâte de participer à un atelier ! I would be very interested in your first cookery classes so please let me know if there is any chance I could join you in March. That’s got to be so exciting to continue the legacy of a former cook in your new kitchen! Wishing you many healthy and bountiful meals. How adorable that your son is concerned about the recipes in your book…I am not the most patient in the kitchen so I will have try one out and let him know. Enjoy your new nest. Hello Mimi! I would love more information on the March workshop! Would love to catch to train to Médoc! I have just stumbled across your blog. It is absolutely gorgeous. I’m going to tell my mother because I know she’s love it too, particularly since she is planning on a trip to France (from Australia) next year! Are you happy with your new stove?? Is it taking a little tweaking to get just right? ?Oh Mimi, I know that sadness of leaving your new home to go back to the old…..not long now. The stove in Jindivick, being wood-fired, has taken a little getting use to but I just love it now. Firstly, it roasts meats beautiful, secondly, it warms the kitchen. I’ve become Felicity Kendall from The Good Life also reading, knitting and warming my toes by it. It’s a Stanley, and came from Waterford in Ireland, a 6 month wait so I could have it in red. I believe red appliances work better…ha ha. Last night, I roasted a chicken bought from the farmers market. The breeder also sold the birds. If it wasn’t for his thick Aussie twang, he could have passed for a Frenchman. His passion explaining how long to cook the bird, what temperature is best, the breed and nearly its blood group!!! !………it’s the best I’ve eaten since France and the best since I was a little girl, chickens, raised by my Father. Oh yes Mimi, the recipe…….Roast Chicken with Creme Fraiche and Herbs…….you may be familiar with it. Thank You Thank You Thank You Dear Mimi for allowing me to share your magical journey with you! Your blog is simply wonderful and your cookbook magnificent! I would love to reserve a spot for Fall 2015 so let me know when you finalize everything! I hope the upcoming Holidays are filled with endless love and blessings for all! Those pears, they look like Heaven’s food, really! Coincidence, fate, or merely serendipity, you were meant to bring that beautiful home back to life. Thoroughly enjoyed this post and hearing more about Plantia Plantieu. Have no doubt that room-by-room that house will take on a beautiful new life for you and your family. I hope to stop in next week when you are in NYC for book signings. I expect you will have many happy fans awaiting your visit. Your bone marrow trick is intriguing and I think I may have to try that and see what we think. Congratulations on all your hard work and thank you for creating this online place. It is magical. It’s so wonderful that you’re in New York! I’ll definitely come to the signing event, I love your blog so much, it will be wonderful to meet you! I would like to know more information concerning your March classes and also future classes. Hi Mimi, I would love to sign myself and my husband up for this workshop in March, how do we book please? I’m a long time follower but first time commenter. I am interested in your workshop for the 17th of March 2015. Please keep me updated about details once they come to light. Well wishes from Champagne Ardenne. Your blog is just the most inspiring ever!!! And the recipes!!! Amazing! I will be there to purchase a second book for you to sign in NYC!!! Can’t wait! Safe travels! Beyond fabulous Mimi! Would you like to adopt me? I’m very well behaved. If not, is there some beautiful unloved house, with a few hectares, that needs a new family to bring it back to life in your region? You are such an inspiration. Love the idea of you having your own place, what could be better than surrounded by vineyards. Your Mother was wonderful at making creeps in your little kitchen in Happy Valley. Her lentil soup was to die for as well. I hope I can find your book in the shops in the UK? Would love to come and visit next summer and take some classes. I’m from Hautefort, Dordogne and I live in New York city now. I would love to meet with you while you are here! I admire your talent and I’ll try to stop by your book signing at club Monaco. 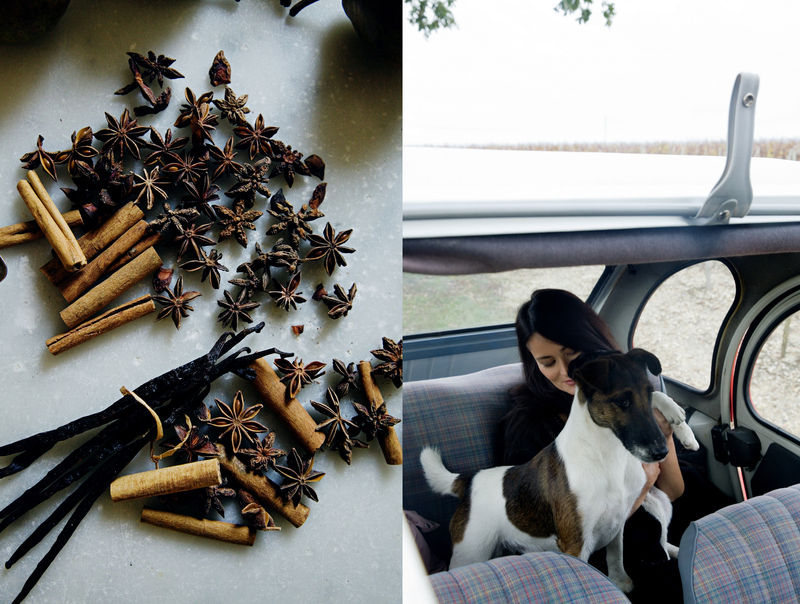 Mimi, Your blog makes my heart ache to return to France. I miss it so. I adore everything you post. How do you manage to be so chic and do so many wonderful things with children and a new baby! What a great idea. Love to visit and take some lessons next summer. All you hard work is coming together. I will try to find your book in the UK. Hello Mimi, so amazing! I´m going to fly with my friend to New York tomorrow. We are from Finland and I was planning to buy your book in this trip, before I even know that you are in NYC too. So exciting. We are coming to Club Monaco on Thursday. See you soon. Taking a cooking class with you is on my bucket list! Please include me in your mailing list for classes next year. J’adore tout! Hi Dianne! Will do – please do send me your email to [email protected]. Merci. Did you know you are developing quite a fan club right here in Bordeaux! But we haven’t been able to find your book in Bordeaux, not even at Mollat. Are we missing something? Best wishes, and hope to meet you soon. Mimi, you done me dream of this post, congratulations!!!. Muakes from Seville (Spain)!!. Your family is just too beautiful, Mimi! And your son is a sweetheart~so awesome that he’s so passionate about your work. 😀 Ps: pears truly are beautiful to paint or capture! Funny how some foods look like art to us foodies. Bonjour Mimi, I was waiting impatiently for the launching of your classes. I would love to attend the first one if there is availability. You can count me in! I’m trying to resist buying your cookbook in english right away just because it will be easier in french with the measurements conversions but I’m not sure I’ll be able to wait until Jan 2015! Hope to hear from you and thank you for your delightful blog. Fall is so beautiful there. I was wondering if you had posted a list of your workshops that will be starting? I think I missed that one. I can’t be the only one dying to see a picture of the staircase, can I?? Your book arrived a few days ago. I have never read a cook book with so much delight! I enjoy your stories and enjoy the way you tell them. I also grew up in HK and have relocated to a rural small town in Canada now. We took that step and have not looked back. Love our country life! Back to your book… my 11-yr old daughter took it to read and all I could hear was giggles interspersed with oooohs and aaaaaahs. She loves food and loves to eat. Your images are irresistible… I’m sharing your recipes with my husband who is our family chef, too, but I will try your recipes myself some time. I took professional French cookery in hotel management school years ago but it was school and my approach then was somewhat clinical. Your blog and book are a great inspiration and I would like to attempt again. I’m so excited to have the book— it was such a great package to get in the mail — and its lovely recipes (especially the Roquefort & Walnut Gougères)! I’m sad to say that I traveled to Kisan for the book signing, and when the store employees found out I had my preordered book for signing, they turned me away. In order to ‘qualify’ for the event, I was told I had to buy a book on-site. I was rather deflated, having made the trip, since the information wasn’t on this blog, and I can’t make it to the other signings. C’est dommage, mais bon j’ai quand-même le livre pour Thanksgiving! Thank you for sharing your beautiful recipes and photos with us! I ADORE your cookbook! I hope you and your readers will visit my blog! It’s mostly food and fashion, and a couple tidbits from daily life! A bientot! such a pleasure reading your thoughts and feelings on your new home. sounds as though you have the beginnings of a suspense novel brewing in your noggin. You have a beautiful home, lovely family, excellent culinary taste and what appears to be happy dogs. I’m curious as to the breed of these very handsome puppies. I’d love to receive more details about your cooking class starting in March. Would you please send me further information? It was so wonderful meeting you at your book signing at The Strand in NYC. I would love to come to the March 17 class if possible. My birthday is also in March, what a wonderful birthday gift it would be to cook with you! I left a comment previously but it didn’t seem to go through. Just want to say my daughter (11) and I are both enjoying your book a lot, and it’s great you included the recipes of some of our favourite Chinese dishes! We like reading about your stories and like the way you tell them. Also, your husbands photography is fantastic! The two of you (and your kids… and your dogs…) make a great team! I have been viewing your postings with every anticipation. The beauty and composition of your topics and artwork are a delight and comfort for sore eyes. You are showing me a world I would not know without your generosity. Wishing you and your family a wonderful holiday season. Saluté! Joe in Walla Walla AVA. So happy to hear that people from all over the world are planing to come to Medoc to be part of your workshop. I think we are all on the same length & becoming a big “gourmet-family”. And wonderful recipes, as usual !!! Lovely…. You met my sister and her husband at one of your book signing stops in NYC. Käären Schilke-Cherns and her husband Trishul Cherns. And their Jack Russel Terrier DART….She was so excited …. .
BRAVO pour les fiches Cuisine dans ELLE cette semaine avec en plus de trés belles couleurs !